The primary text for this course is Holistic Tarot: An Integrative Approach to Using Tarot for Personal Growth. This Companion Course consists of video lectures, which you can access by links below and Study Guides. Please watch, check out, download, access, use bits and pieces of the companion course for free! Do not feel any hesitation about working with parts or watching the videos without payment. And please help me spread the word about the course and my book by sharing the video links or site pages freely! I don’t think having a copy of Holistic Tarot is required for you to utilize this companion course or reap benefits from it. It does help, however, since I make references to pages in the book but don’t discuss the actual contents. The syllabus for the companion course is also a specific syllabus for navigating Holistic Tarot. Nonetheless, I was mindful of those who might not have the book and tried to craft a series of videos that would still be instructional for such folk. The Holistic Tarot Companion Course consists of a video lecture series. Each video in the order that I recommend you watch them in is linked below. Closed captioning is provided for the Deaf and H/H, or if for any reason you need English subtitles, so once you are taken to the YouTube page, if you need closed captioning, be sure to click on the “CC” icon to turn the subtitles on. If you are new to tarot and don’t yet have a copy of Holistic Tarot, watch Videos 1, 2, 3, and 4 linked below. You can also watch the old 2014 book trailer announcing the publication of Holistic Tarot, here. Then go to the Study Guides page and scan through the “Study Guide for the Beginner Tarot Student.” You can download the PDF directly by clicking on the below banner. You’ll then be working through Videos 5, 6, and 7 at your own leisure and discretion while you complete your Beginner level study. Then work through the book, following the order recommended in the syllabus, and in your own time, watch the rest of the video lecture series. Holistic Tarot is not light or riveting cover to cover reading that you’d take with you for a day at the beach. It’s not a thriller. It’s a reference manual that you dive into here and there for, you know, reference. Continuing education as tarot readers is how we grow and deepen our practice. I still take beginner tarot courses from teachers with radically different approaches or styles from myself to add new dimensions to my own work. So if you’d like such a course, then start by skimming through the “Study Guide for Tarot Beginners” to see if anything in there interests you and “spot read.” Then watch Videos 1 through 7 linked below. Bear in mind that the video series is targeted specifically at tarot beginners. 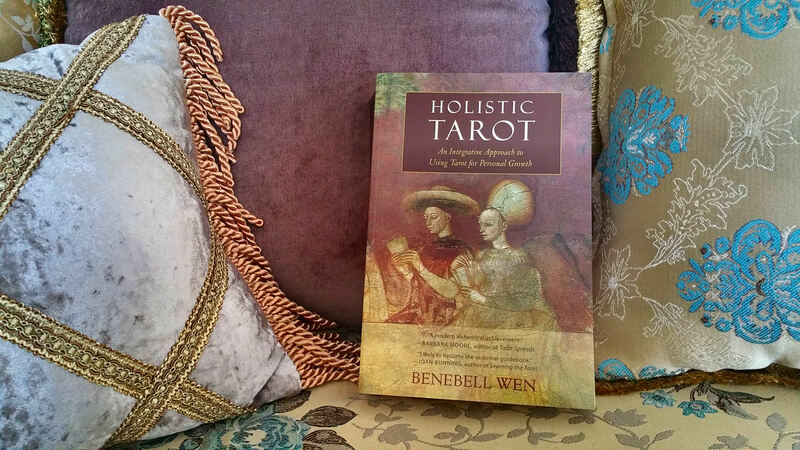 An introduction to the classical and analytic approach to tarot that Holistic Tarot takes and how to work through this companion course. The video lectures will be academic in approach with the tone of graduate level curriculum. How classical studies in tarot deepens your grasp of symbolism. This video includes a quick dive into art history to demonstrate how knowledge of history and culture enriches your appreciation of symbolism. Funny Personal Background Story Here: I had a dentist appointment prior to recording this video where I had three cavities filled. My mouth was shot up with numbing agents and I was drooling involuntarily. Still, I had already intended for my own schedule and to-do list to record the video that day so I persevered forward, swollen mouth notwithstanding. Unfortunately, for some of the beginning bits, I sound like I’m talking with a mouthful of cotton. Because I was. Keep a tarot journal by assembling the Holistic Tarot study guides, handouts, and your own journal notes into a three-ring binder. By the way, here are a few of my recommendations for RWS-based beginner tarot decks. An overview of the tarot structure, the Major Arcana and the four suits of the Minor Arcana, will also be covered. In this first of two installments on addressing myths, superstitions, and common lore around the tarot, we explore whether tarot is evil, superstitions around Aleister Crowley’s Thoth Tarot, whether tarot came from Egypt, and some thoughts on tarot and the Bible. In this second installment on addressing myths, superstitions, and common lore around the tarot, we explore the zeitgeists from which the early cards sprang. Topics such as whether your first tarot deck needs to be gifted, how to store your tarot deck–in black silk or a wooden box, the correct way to shuffle a deck, card reversals, and the emotional value of superstitions are discussed. 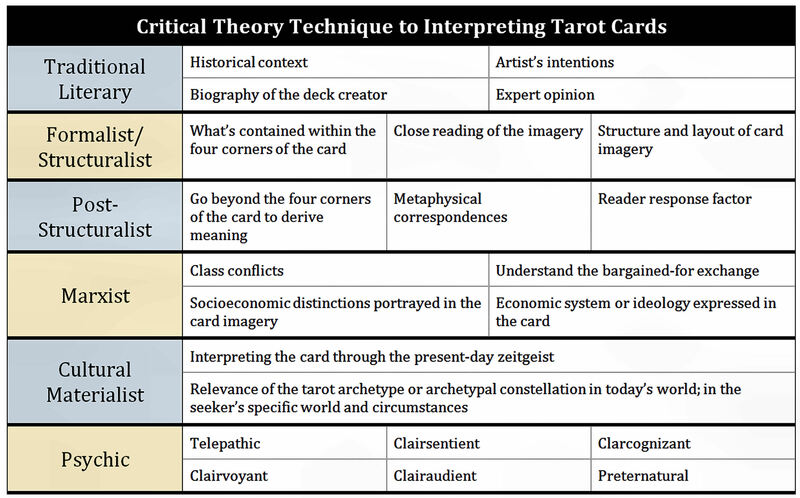 We begin with an outline of tarot card trends over the last century, how to apply critical theory to interpret a tarot card (we’ll be using Key 13: Death to demonstrate), and talk about what a tarot spread is. Then take out your tarot deck and follow along a guided tarot reading with the Wirth Cross. So you’ve got a new deck (either tarot or oracle). What does bonding with your deck mean? Why would you need to configure a deck by bonding with it? Presuming you are open to the idea, how do you bond with a deck? This video lecture addresses how to program 78 pieces of cardstock to your personal specifications. How do you take that off-the-rack tarot deck and custom tailor it to you? Suggestions are offered ranging from practical and mundane to the mystical and magical. Toward the end of the video, I address the intermediate and advanced tarot readers, challenging them to make a concerted effort to bond with a tarot or oracle deck that is in direct contrast to their personal ideological and spiritual leanings. Videos 01 through 07 coincide with the Study Guide for Tarot Beginners (PDF). Videos 08 and onward will presume tarot proficiency commencing at the Intermediate level. Before proceeding with the subsequent videos, begin putting together your Intermediate study tarot journal. Be sure to check out the supplemental downloads for the Intermediate level. 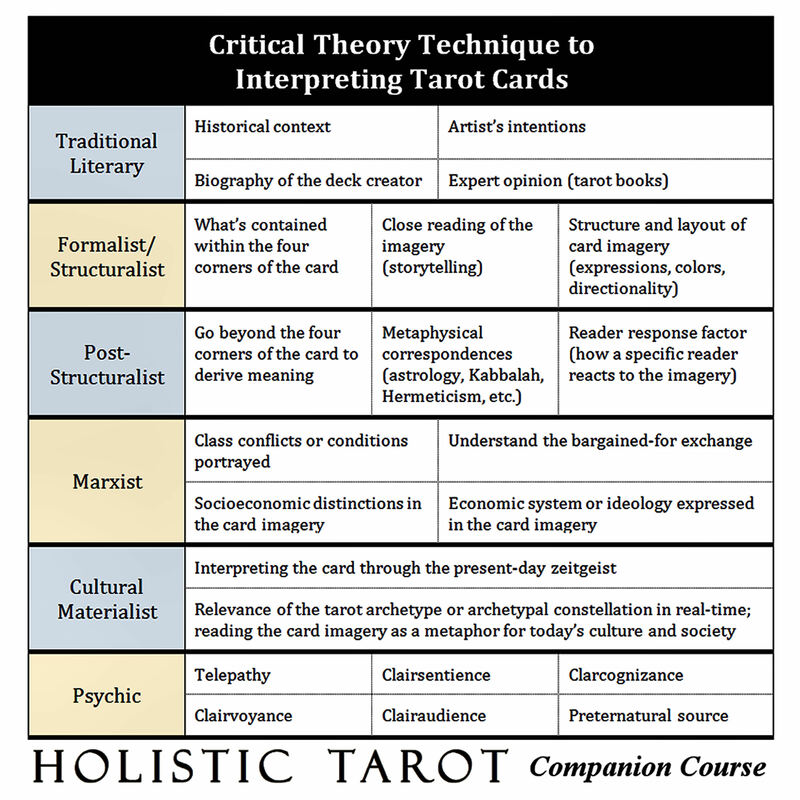 In this video, we break down the various approaches to interpreting tarot cards by understanding six main paradigms of critical theory. New videos will be added to the tarot lecture series periodically. Be sure to check back or subscribe to my YouTube channel for updates. New documents will also be added to the Study Guides page from time to time, so if you don’t want to miss out, add me on Twitter for updates. Click on the below banner to access all syllabi, study guides, and supplemental downloads for the companion course.